For fiscal year 2018, net earnings amounted to $283 million ($4.48 per share) compared to a net loss of $258 million ($4.11 per share) for fiscal year 2017. Sales amounted to $5.5 billion for fiscal year 2018. In 2019, our paper shipments will increase as we respond to increased demand from our customers following the announced capacity closures. Paper prices will continue to improve in the wake of the recently announced price increases across the majority of our paper grades. Softwood and fluff pulp markets will remain balanced through the year due to continued steady demand growth and limited announced new capacity. We anticipate costs, including freight, labor and raw materials, to marginally increase. Personal Care is expected to benefit from our margin improvement plan and new customer wins, partially offset by further raw material cost inflation. 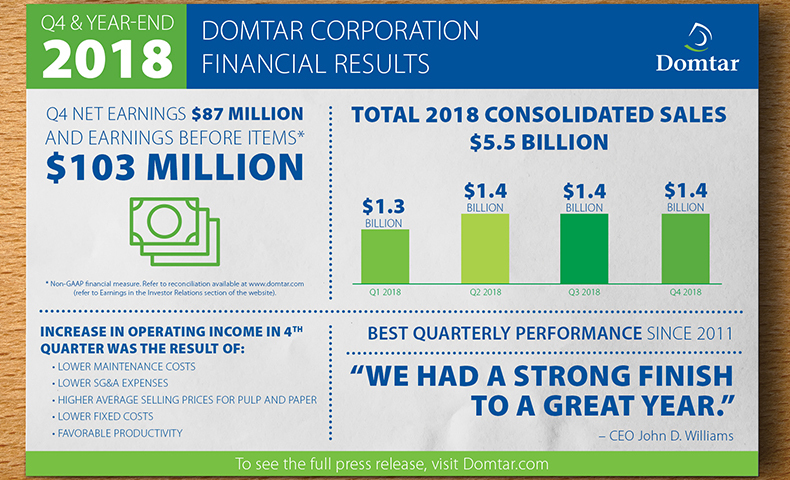 For more information on this Domtar quarterly and fiscal year 2018 financial report, please read the full press release. This and other press releases are available in our media center. All information from the Domtar quarterly and fiscal year 2018 financial report is in U.S. dollars, and all earnings-per-share results are diluted, unless otherwise noted.